Grand Band Homecoming, September 20, 2013! This year’s Homecoming is more special than ever, with the dedication of our new band facility. And we’d like to see as many band alumni return as possible for one of the most important moments in Big Red Band history. More details will be made available in the weeks ahead, but make sure you’re there for the dedication and luncheon celebration, on Saturday, September 20, beginning at 11:30am. Look for registration information via email soon, but in the meantime, don’t forget to book your hotel rooms. We’ve reserved blocks at several local hotels, but they’ll go fast, so book now. Well, it’s that time of year again: final exams are done, dorm rooms are all packed up, and another senior class will soon move on to bigger and better things out in the real world (or at graduate school). It seems like just yesterday it was August, and we were welcoming the Class of 2016 to our ranks; now, as another academic year draws to a close, we are looking forward to our big move into the new Big Red Bands facility on Kite Hill at the end of May, and to Reunion Weekend (June 6-9, 2013). Hello! My name is Anita Mbogoni ’15, and I hail from Queens, NY. I am a biology and society major in the College of Agriculture and Life Sciences, with minors in inequality studies, science and technology studies, and music. In addition to Alumni Relations Chair, I’m very excited to serve as Clarinet Section Leader this year. The band has had an overwhelmingly positive impact on my Cornell experience thus far, and I eagerly await another year of great music and wonderful memories with the only REAL marching band in the Ivy League! My name is Kevin Milian ’15 and I come from Guatemala City, Guatemala. I am a communications major in the College of Agriculture and Life Sciences, with a minor in archaeology. Being in the marching band for the past two years has been a blast. I brought in the freshman Class of 2016 as Publicity Chair and now I get to work with the other side of the coin–our large alumni network. As the band moves to our new facility, I anticipate a new “golden age” for our band, and I’m excited to be a part of it. Here’s to a great new semester! Let’s Go Red! As a way to reduce our carbon footprint, we are getting rid of paper issues and going green. We hope you enjoy this first digital issue of the Band Notes! If you have any questions, comments, or suggestions, please feel free to write to either of us. You can reach Anita at aam93@cornell.edu and Kevin at kjm259@cornell.edu. We look forward to meeting you all in the coming months! I am honored and excited to write to you as the new Chair of the Big Red Bands Alumni Association. It is a great time to be associated with the Big Red Bands, with the imminent opening of the new band facility and what will certainly be one of the most exciting Homecomings in a long time! Before I continue, I want to thank our outgoing Chair of the past four years, Eva Chiamulera ’97. While the day-to-day operations of the Bands are quite appropriately the responsibility of the student leaders, Eva has worked hard behind the scenes over the past few years to assist them in their endeavors. Eva put in countless hours in between meetings to allow the Band to thrive despite some difficult transitions. So if I may… aardvark Eva! I’d like to lay out my priorities for the Big Red Bands Alumni Association for the next two years. First and foremost, we will streamline communications with all of our alumni. Our listserv, BRBAA-L, is long defunct, Facebook doesn’t reach everybody, and print newsletters carry issues of timeliness as well as cost. Over the next four months, we will develop a strategy for keeping you informed of what is important in the Big Red Band universe. And most importantly, we will let you know what that strategy isso that you know where and when to expect updates. While it is an intermediate step, this electronic newsletter is a large part of how we intend to keep in touch with you moving forward. Second, we will develop and cultivate relationships with key stakeholders in the band. This includes traditional associations (Athletics, Music) but also underutilized resources (Alumni Affairs, Student and Academic Services). By doing this, we hope to maintain the important stature of the Bands to Cornell, both on campus and beyond, and position ourselves to best empower the student leaders. Third, we will continue the BRBAA’s strong tradition of long-term financial planning and fiscal responsibility for the Bands. 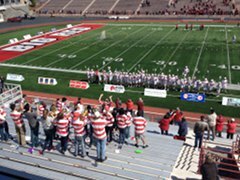 The bands have never wavered in their support for Cornell, for example, by traveling to FIVE different NCAA tournaments in a given spring semester. Of course, this requires careful planning and allocation of resources, and we will do our best to ensure that opportunities for Band members to have better experiences are only limited by how far the teams go! Moving forward, we hope to inform you, our loyal alumni, on what is going on with the Big Red Marching Band and the Big Red Pep Band. What I ask of you is to let me know what you want to know! Are you interested in how we’re using your generous gifts? 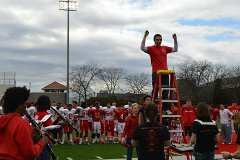 Are you wondering how the band functions in the ever-changing Cornell landscape? Or do you want to see some pictures of the students in action and know if they’re still playing <fill in your favorite song here&rt;? Please feel free to reach out to Marching Band Head Manager Shelby Hulett, Drum Major Steve Albanese, Pep Band Manager Nick Lamson, or our wonderful Alumni Relations chairs, Kevin Milian and Anita Mbogoni. I want to hear from you, too – you can reach me at lhf3@cornell.edu. Whether you follow the Bands’ exploits closely, attend a football or hockey game once a year, or anything in between, your support is what allows the great traditions that we all enjoyed to continue and for new ones to develop. In many ways, you are helping the same Big Red Band spirit and personality that we all loved in our college years positively influence many generations of bandies as well as amuse, entertain, and excite audiences in Ithaca and beyond. Doing what only two other duos have done in Cornell Big Red Band history, we have been drum major and head manager together for the past two years. From our first meeting in Okenshields to becoming the best of friends, from the blizzard at the Princeton game in 2011 to the incessant downpour during the groundbreaking at Homecoming 2012, from being stranded at the Canadian border to losing four buses in Manhattan, leading the only REAL marching band in the Ivy League has been quite a life-changing journey. 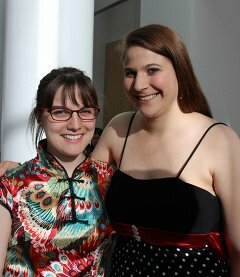 The first time I saw Jess I got so excited I spilled 2000M HCl on my hands (we had honors chemistry lab together). This excitement that defines our relationship to this day has never ceased to spice up even the dullest of times in the BRMB… oh wait, there were none. Over the past two years we have had the unique opportunity to hone our leadership skills while having the privilege of interacting with past, present, and future members of the BRMB. While our first year was spent mostly figuring things out, we felt that in the second year we were able to implement some changes that have helped the band become a better organization. Although we will be sad not to have the BRMB in our daily lives this upcoming fall (why is there no marching band in the real world? ), we know we are leaving it in good hands. We were so excited to help with the development of the plans for the new band facility and look forward to attending future reunions and homecomings in this new space. Even though the basement of Barton will always hold a special place in our hearts (and perhaps our lungs), we’re glad to see the visions of many past and present members being put into action in the new band facility. We are excited for the many opportunities this move will afford the band for interaction with the community, in addition to the fancy new doors and storage spaces. This summer, when Jess ventures around the globe to teach in India and Jen takes her ruby slippers on down to Columbia University (not to be confused with Colombia, the Latin American country) to earn a master’s degree in secondary education, we will both be far from Cornell and the group of friends that we have been so fortunate to make through our participation in the marching band. The past two years have been an unforgettable experience and we are both so glad to have had the chance to lead the BRMB. Without the band, we would both be much different (probably more sane) people, and we feel so special to have been able to impact and be impacted by the only REAL marching band in the Ivy League. 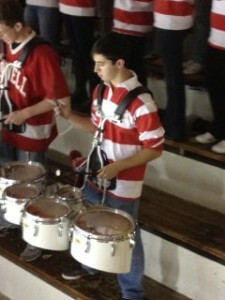 It’s difficult to even to describe the impact that band has had so far on my Cornell experience. From the beginning, I knew that I wanted to join band, but I was apprehensive because my high school only had a pep band. I had never marched before, and I had an irrational fear that not being able to march would be a problem. In retrospect, the thought of not fitting into band is ridiculous, and that’s what makes it so special. The one thing that the Big Red Band does better than any other organization on campus is making every person feel welcome. Coming into a big school like Cornell, it’s easy to get lost. Band snags you from your parents on registration day, immediately immersing you in a group of 200 people who want to meet you. Throughout the fall, I was just taken aback by how genuinely friendly these people were. I wasn’t that involved in band socially until October, but once I became more involved it was as if I had been there the whole time. My band friends became good friends and I no longer felt merely welcome, I felt wanted. Likewise, I wanted to get more involved in band, so I ran for Pep Band secretary. When spring semester came, it all started to feel real. In the fall I was still a freshman who knew next to nothing about anything. But due to the Pep Band being split across several simultaneous events during particularly busy weekends, I found myself playing snare and rolling off for Davy at men’s hockey playoff games and actually having responsibility in the band. Though scary at first, it made me really understand what being in the band means. As the year went on, my band friends became my best friends who I knew I could count on. When my housing situation for sophomore year got complicated, it was the residents of the tuba-sax house that helped me out. I go to pep band events all week and yet somehow I’m still not sick of it by rehearsal on Monday. Band is my life now and I couldn’t be happier about it. There isn’t an organization quite like it anywhere else. But of course, it is the traditions that hold us together and make us who we are, and for that we must thank the alumni. The great, friendly people who made me feel welcome would not be here if they hadn’t been treated just as well when they entered the band. I was afraid of marching but the second I saw just how the Big Red Band marches, I knew there was nothing to be afraid of, and while we scream our heads off and dance up Tower Road, I know that somebody a long way back decided that it would be a good idea, and for that we say thank you. As freshman year rolls into a close, I know that my four years far above Cayuga’s waters will be much better than I ever could have expected, thanks to the Big Red Bands. This year, the Big Red Marching Band has significantly expanded its outreach and community service efforts. This increase has been met with a very positive reaction from both band members and the community itself. The wide range of events that the band participated in were a lot of fun for everyone involved, and gave the band great exposure in the Cornell community. The spring semester has included three large events so far. The first was Relay for Life, the well-known fundraising event for the American Cancer Society. Although the marching band has registered a small team for the past few years, this was our first opportunity to perform. The event held in Barton Hall, so the band paraded around the track and performed a concert on the nearby stage. It was a big hit, and the organizers invited us back “next year and every year after that!” The band also registered its usual team of students to walk in the relay. Highlights of the night included a small crowd of band members attempting to do Zumba at two in the morning, donating money to pie the drum major and head manager, and raising a total of $800 for cancer research. The second event was a Bone Marrow Donor Drive through Be the Match, an organization that helps add people to the bone marrow registry. Band members handed out quartercards on Ho Plaza in front of Willard Straight Hall, helped sign people in, and even registered as members themselves. The band added 20 people to the registry and raised a total of $700. Michael Garbin, the visiting representative from Be the Match, was so impressed by the band’s effort and enthusiasm that he offered to write a community service related letter of recommendation for anyone who helped out. The band also had a performance inside the Statler Hotel to kick off Hotel Ezra Cornell, an annual conference hosted by Hotel Administration students for leaders of the hospitality industry. To start the event with a bang, the band paraded through the Statler on the students’ lunch break, and then played a concert inside the building’s entryway. The performance was a great surprise for all the hard working students! They crowded around, took pictures with Touchdown the Bear, and sang the Alma Mater as the band played. It was a lot of fun to play in a different building to a different crowd, and we’re happy that the hotel students enjoyed the show. We were involved in several more community service events throughout the rest of the semester, including playing host to a blood drive. This involved raising interest before the drive, helping people sign in, and handing out juice and snacks to donors during the drive. We also volunteered at Expanding Your Horizons – a program for seventh to ninth grade girls that aims to stimulate their interest in math and science, and participated in Nate’s Run for Smiles, a 5K in memory of a Cornell student that raised money for a new children’s hospital playroom. Our final service projects of the semester involved building trusses on Ho Plaza with Habitat for Humanity and working in the Plantations with the YMCA Making Trails Project. As you can see, it’s been a very busy semester, but the community service events have been a great experience. Whether the band is performing or volunteering, it’s exciting to know that we’re putting the famous Big Red Band energy into supporting some amazing causes.